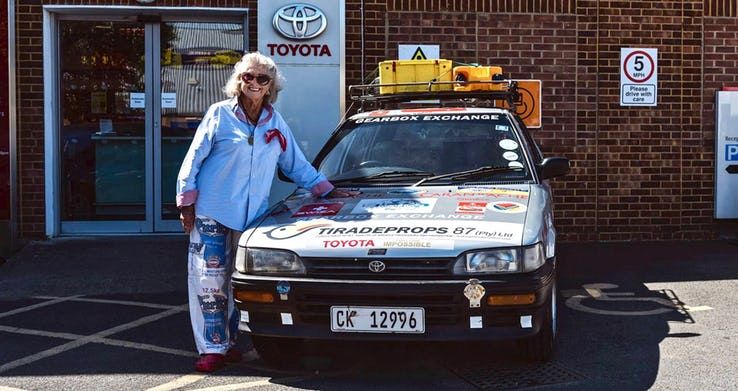 Julia Albu, 80, drove from Cape Town, South Africa, to London, England, just to prove a point. 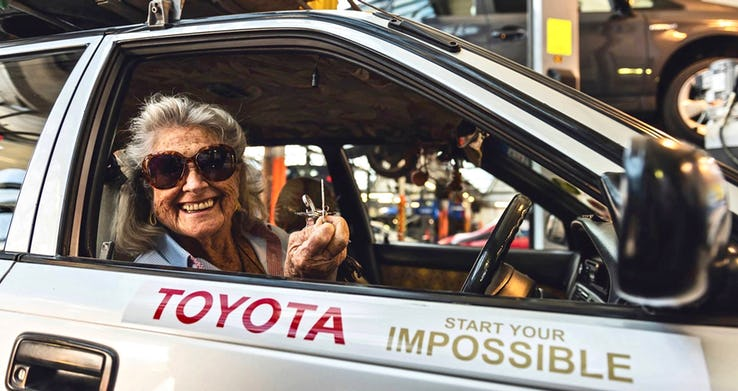 The grandmother crossed Africa in her battered Toyota Conquest after listening to a story on the radio about the president and his extravagant taste in cars. Albu called the radio station, after hearing about former President Jacob Zuma’s collection of luxury cars, to express her distaste. “I was incensed. I phoned in immediately to say I was going to be 80, and my car, Tracy, was a 20-year-old Toyota and she ran beautifully. We could happily drive to London together, so why Zuma needed all these new cars was beyond me,” Albu said. After she was cheered for her remarks, she decided to prove her point by embarking on a journey to purportedly meet the Queen at Buckingham Palace for tea. “My partner had recently died, you see. It was an exhausting process, and after all that, I thought, ‘My goodness, there really isn’t much of life left’. I feel like I’m 36 from the shoulders up and 146 from the shoulders down, and I wanted the younger me to win for once,” she said. Six months later, Albu headed out with Tracy, who was now adorned with numerous rainbow-colored stickers representing her sponsors. “I was raring to go. I had been inoculated against every known virus, although the doctor said he didn’t think I’d need any STD precautions, which was insulting. And Tracy was looking beautiful, upholstered from the seats to the sun visors in pink florals,” she said. Her age made crossing borders somewhat easier, as many agents quickly stamped her passport after hearing about her intention to have tea with the Queen. “Oh to be 40 years younger and not in this godforsaken body. The mountains I would have climbed; the lakes I would have swum in,” she said in regards to the limitations her age put on her trip. Albu, however, did make the most of her encounters with people, filling her diary with the names and addresses of countless friends she made along the way, including teachers who she pledged to send books to. In Tanzania, she hung out with honeymooners at a resort. In Ethiopia, she camped with twenty-somethings in the Danakil Depression, which is often described as the “gateway to hell.” “I think I got my moment of purest joy when I was driving alone through the Sudanese desert on the long road to Khartoum. My tape of hymns was playing at full blast and I was singing ‘Jerusalem’, thinking about England’s green and pleasant land while a shepherd shuffled through the sand in the distance,” she said. After a few months, Albu boarded a plane to Greece where she met Tracy, who had arrived in a shipping container. She continued her journey, driving through Albania, Montenegro, Croatia, Slovenia, Austria, Germany, and Holland, finally arriving in Londonin the summer. “Oh, I was dying to have tea with the Queen – particularly after telling the world and his wife that I was going to. But it was the week of Royal Ascot and apparently, she was otherwise engaged. The English are a strange breed – I’m not sure they appreciated quite how long my journey to Buckingham Palace was,” Albu said. 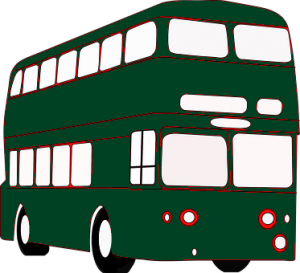 Despite not meeting the Queen, Albu’s adventure continues. 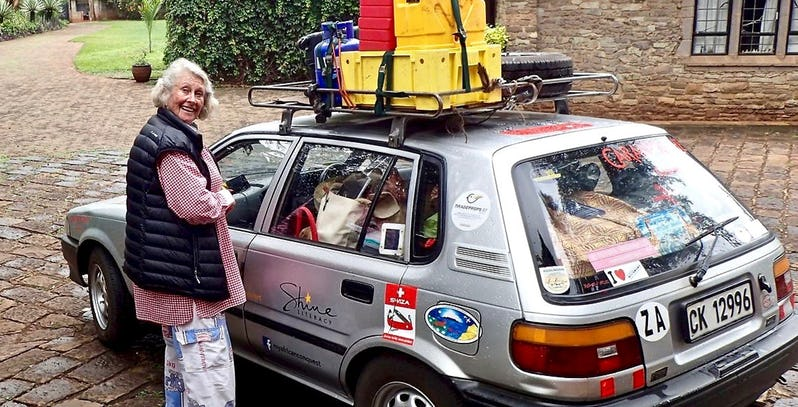 After London, she drove to Italy to board a ferry to Tunisia, where she will drive back to South Africa. “Well, why not? What do you want me to do, sit on this sofa and wait to die? There is a freedom that comes with old age that so many people don’t realize. I didn’t know it before my adventure, but at my age, you’re actually freer than you’ve ever been – you lose a husband and the children are grown, and you worry less about the consequences of everything,” she said.